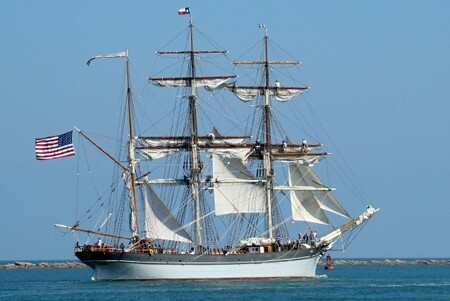 Elissa, Texas’ 'Official' Tall Ship. 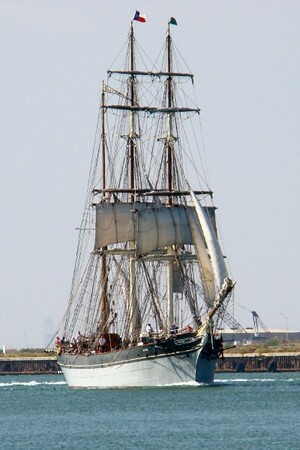 Launched in 1877 in Aberdeen Scotland, the Elissa is an iron-hulled, square-rigged bargue. 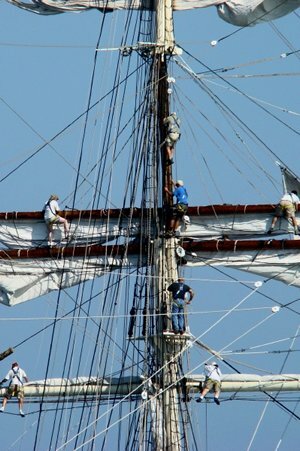 I62 feet long with a deck length of 152 feet, the Elissa is the Official “Tall Ship” of Texas and is owned by the Galveston Historical Foundation. Elissa began hauling coal and spent most of her life as a her career as a tramp freighter - picking up whatever cargo was available for delivery to whatever port was receiving. Her American ports of call included New York, Boston, Savannah, and Pensacola. 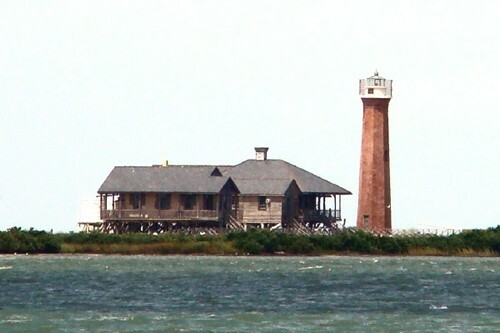 She made at least two visits to Galveston (1883 and 1886), unaware that it would eventually become her permanent home over one hundred years later. She and her sister sailing freighters were threatened with extinction by the steam freighters that could “sail” without needing wind. Damaged in a storm, the ship was sold in the late 1890s to a Norwegian company where she carried freight for 14 years as the Fjeld. In 1912 she was bought by a Swede and again renamed. Now named Gustaf and registered as a Swedish ship, an engine was installed in 1918 and her rigging partially removed, making her technically a barkentine. Her Scandinavian tour continued in 1930 when she was registered as a Finnish vessel and underwent a refitting that transformed her into a schooner. She remained in frigid waters hauling lumber for the next three decades, until she was bought by a Greek firm in 1960. Under the new name of Christophoros, she had nearly all rigging removed and became little more than a motorized barge. In 1967 she changed hands again and although she remained Greek, her name became Achaios. Her hull was recognized by a curator of the National Maritime Historical Society and in 1970 she was purchased for restoration. The curator, Peter Throckmorton even went to the drastic extreme of mortgaging his home to purchase the ship from her law-breaking owners. For purposes of negotiation, the ship was briefly renamed Pioneer, but after purchase she once again became Elissa. 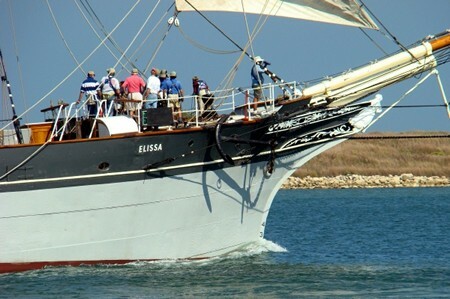 In 1974 the Elissa was purchased by the Galveston Historical Foundation, as a complement to the restoration of the Strand. 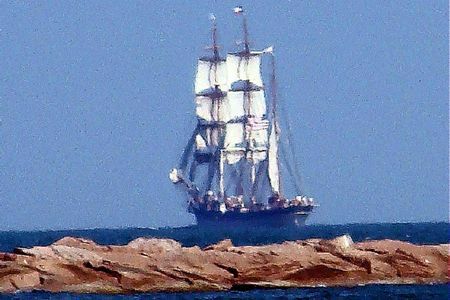 She was the oldest listed square-rigged ship in Lloyd's of London Registry of Shipping. In 1978 the Elissa became the first foreign item to be placed on the National Register of Historic Places. July 20, 1979 she arrived in Galveston to undergo a three-year restoration. In December 1978 the ship began the first leg of her long voyage to Galveston; she was towed to Gibraltar, where she passed the winter. 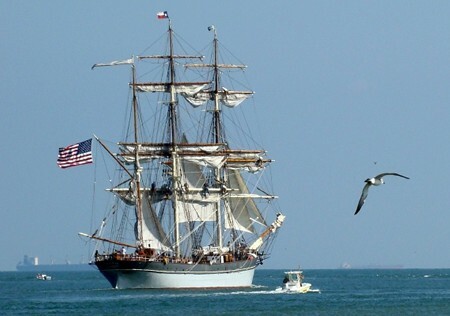 On June 25, 1979, she was towed out of Gibraltar and set sail for Texas; she arrived off Galveston on A dockside celebration with flags and bunting and bands was held in Galveston on August 4 to honor the arrival. 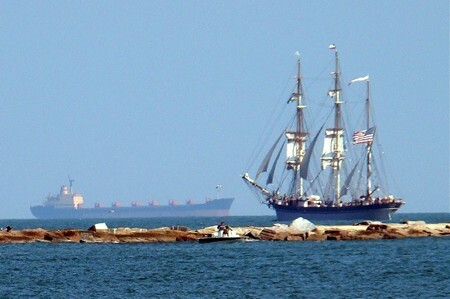 On the 4th of July 1982, she officially became a Galveston tourist attraction. 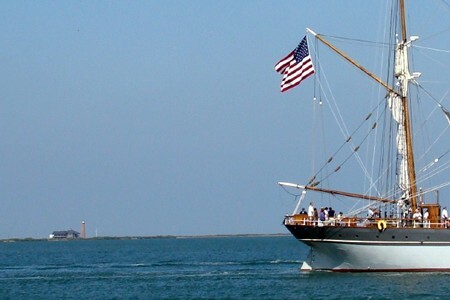 She maintains her sea-worthiness year-round and makes occasional voyages – notably the 1986 trip to NYC to celebrate the Centennial of the Statue of Liberty. The Elissa is now berthed just off the Strand on Galveston Island – at Pier 21. Elissa leaving harbor under engine power. A view of the Elissa without the multitude of small boats that were accompaning her that day. 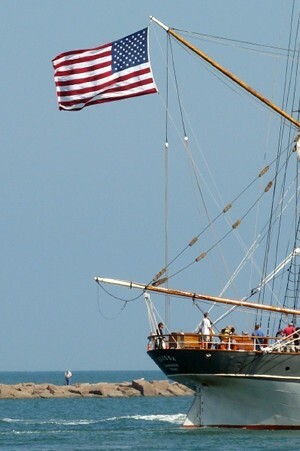 Elissa's stern and the lateest flag she's sailed under.